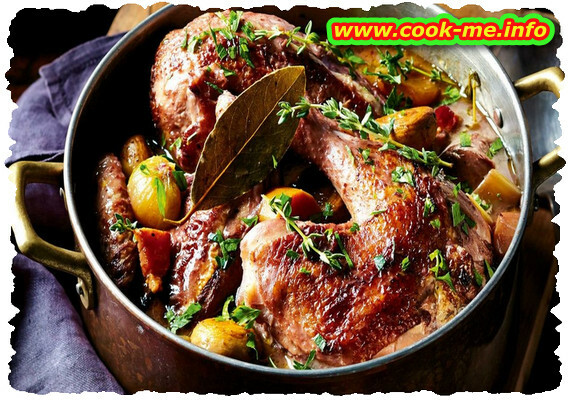 Home Main-dish Meat Coq au vin - is a traditional french recipe. An original famous french dish, coq au vin is a traditional french recipe. Medium complexity , 2 hours cooking time. Cut the chicken into pieces. Cut the bacon into slices then fry them in a pan, on low heat with the chives. When they are brown, remove the bacon with a slotted spoon and add the pieces of chicken. Allow the chicken to brown on low heat. Drizzle with brandy and flame it. Add the echalot , thyme , laurel leaf , garlic and the mushrooms. Cover them and let them simmer ( low heat ) for 20 minutes. Meanwhile, place the bacon in another pan to reheat it , soften it with 3 quarters of the bottle of wine. If you use smoked bacon cook it for 2 minutes. Increase the heat and when the wine starts boiling pour it over the chicken. Add wine until the pieces of meat are covered. Add salt, pepper, sugar and nutmeg. Add the onion, cover again and leave it 30 minutes on low heat. Meanwhile mix the butter with flour. Put the saucepan aside and add the butter, mix it, put it back on the cooker and boil it one more time.